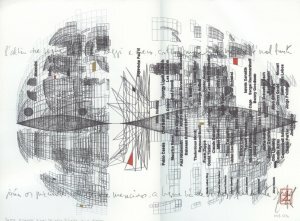 Description	 MS and virtual reality plotter graphics in English, Italian and Portuguese on paper, Roma, 2008, 1 p 43x30 cm, virtual notation illuminated in black, red and gold, composer's logo in red cuneiform, 2 lines in cursive script quoting Dante Alighieri: La Commedia and Luís Vaz de Camóes, autograph, signed 3 times. 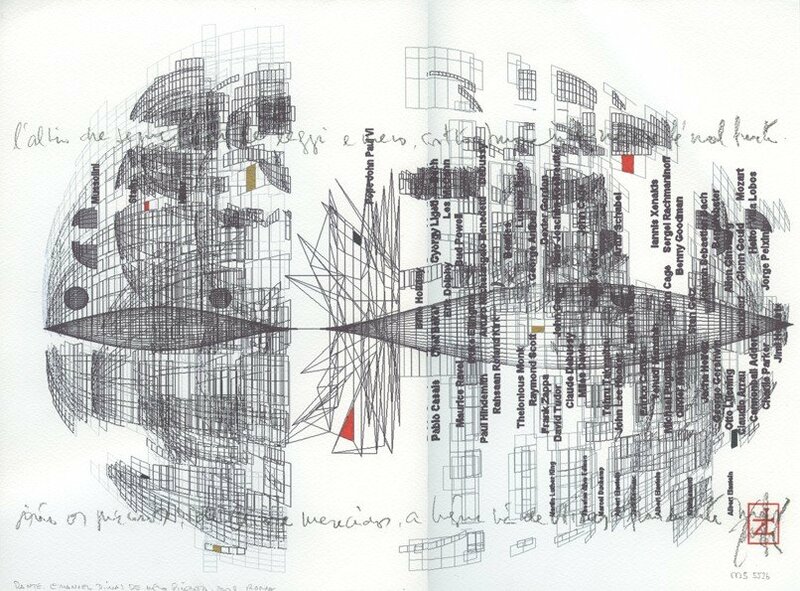 Context	 MSS 5523, 5525-5526 are all in virtual notation by Emanuel Pimenta. Provenance	 1. Emanuel Dimas de Pimenta, New York and Lisboa (2008-2014); 2. Gift from the composer August 2014. Commentary	 Dante is the first opera on Dante's Comedy in the history of music. The Composer's explanation: "It is articulated on three movements and the integral piece is composed by 60 sectors of one minute each. Each minute is a circle of Dante's travel in the afterlife. Thus hell has 20 sections, purgatory 9 sections and paradise 31 sections. - Sounds performed by the musicians, voices, images, all of them no longer alive, turn the opera into a true trip in the afterlife, through our memories. All singers and actors in Dante are real personages, but already died, virtual ones. The world première of the opera happened at the Abstracta Festival in Rome, Italy, in 2008." Published	 Same part of the score as well as 3 further parts published in: Virtual Notations 1980-2010. The music of Emanuel Dimas de Melo Pimenta, Charleston, 2014, pp 322-329. See also	 See also MS 5523 with composer's further commentaries about the composing process, making a score and performance.